Get pure drinking water virtually anywhere using the Camco Water Filter with Hose. It helps reduce bad taste, odor, chlorine and other impurities in water with its 100-micron fiber filter. 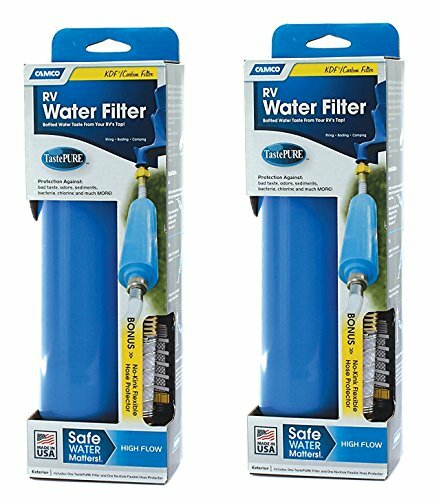 This durable-exterior Camco filter is engineered with a wider body increases water flow and has a large capacity that can last an entire camping season. The high-flow carbon filter also contains KDF to help prevent bacterial growth. It comes in a light blue color that is easy to see and includes a flexible hose protector to minimize kinking.